• There are 152 rooms and suites. • Die Kuche restaurant and bar. • Sauna, Fitness centre, Spa and wellness centre, Massage room, Indoor Pool, Bicycle rental, Bikes available. • Located 10 minutes' walk from St. Stephen's Cathedral. • 1997: August 23, Reopening as a Kempinski Grand Hotel. 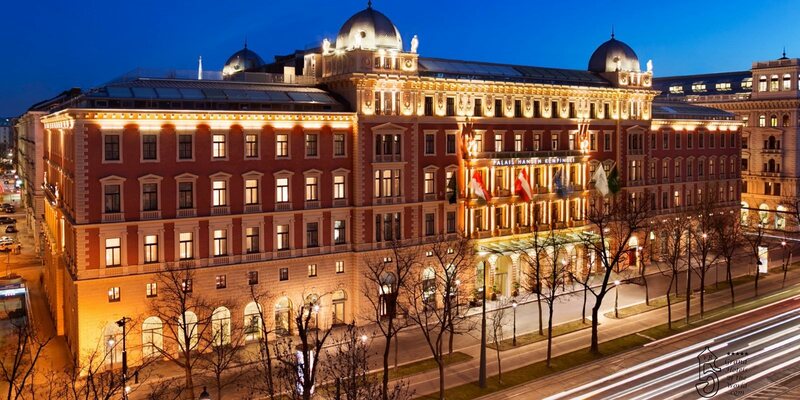 Kempinski is Europe’s oldest Luxury Hotel Chain and has a fascinating history. The company has brought back to life many iconic Grand Hotels with a legendary past. Kempinski was founded in Berlin by Berthold Kempinski. • 1872: Mr Kempinski started with a wine bar to which was soon added different restaurants. Berthold Kempinski’s son-in-law Richard Unger continued the business. • 1918: A Kempinski hotel dependency was established at Kurfürstendamm 27. Over the years the Kempinski family owned an impressive portfolio of Berlin restaurant and hotel properties. • 1937: The Nazis stole all properties from the Jewish Kempinski family. The Kempinskies were either killed or they emigrated to the US. After the war Kempinski’s grandson Friedrich Unger Kempinski returned to Germany and rebuilt Hotel Bristol on Kurfürstendamm 27. • 1992: Lufthansa and others sold their shares to the King of Thailand via his Crown Property Bureau. Over the years the initially very German hotel company became more and more International, with the HQ moving to Geneva and hotels opening in multiple countries. • 1997: August 27, Opening of the reconstructed Hotel Adlon in Berlin. VB.com (Very Beautiful) and on Grand Hotels of the World.com.